SLIS is happy to announce the opening of “Small Craft Advisory Press: A Decade of Collaboration,” the latest exhibition in the Gorgas Library Fifth Floor Gallery. Small Craft Advisory Press is an artist book press at Florida State University’s Facility for Arts Research in Tallahassee, Florida. Their mission is to enable artists and scholars to create collaborative artist book editions that push the boundaries and traditions of the book arts. Since its founding in 2009, it has produced twenty unique editions which are held in collections all over the world. Visitors are welcome to enjoy the gallery during Gorgas Library operating hours. 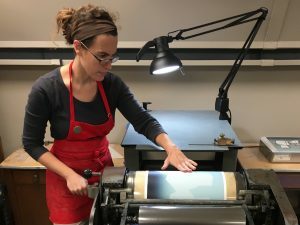 The University of Alabama School of Library and Information Studies is pleased to announce the appointment of Sarah Bryant as an Assistant Professor in the MFA Book Arts program. Sarah is an internationally recognized book artist who has published work as Big Jump Press since 2006. Her books use analytical imagery and reference material to address topics related to archives, self-representation, and data visualization. She frequently collaborates with other artists as well as people working in other fields. Her work can be found in dozens of libraries and private collections in the United States and abroad, including the Library of Congress, the New York Public Library, the Darling Biomedical Library at UCLA, and the Yale Arts Library. 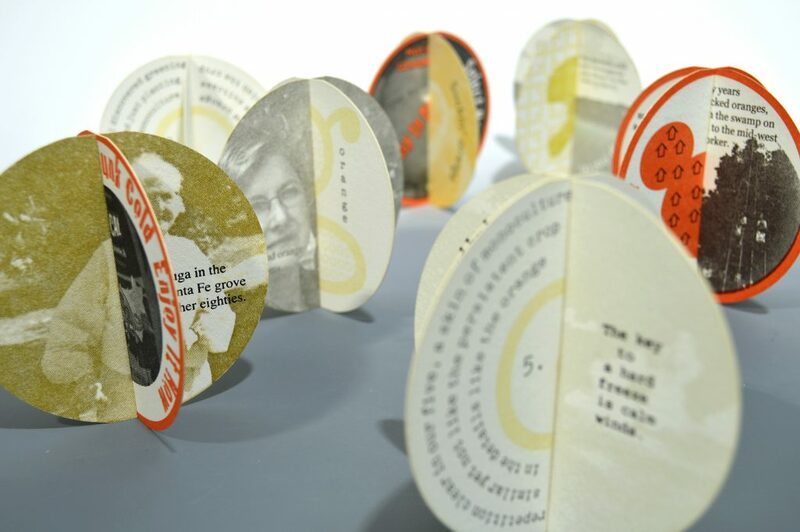 In 2011, Bryant won the prestigious MCBA Prize, an international award given every two years to a single artist book. Bryant received her MFA in Book Arts from The University of Alabama in 2008. She has taught letterpress and Book Arts courses for Wells College, the University of Georgia, and numerous craft schools and studios in the United States and the United Kingdom, where she lived for several years prior to returning to Alabama in 2016. You can learn more about Sarah and her work by visiting her website or blog. Please join us in welcoming Sarah to her new role! 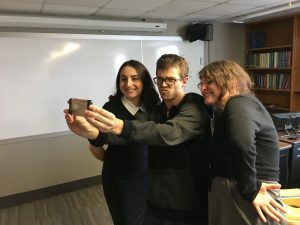 Graduate Book Arts students Victoria Birth (l), Andrew Knutsen, and Alana Baldwin, after their Creative Project thesis presentations, on March 22, 2018. 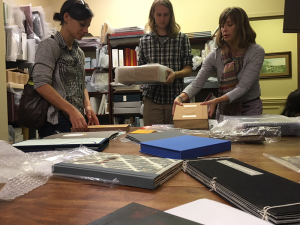 Book Arts MFA students Jillian Sico, William Reilly, and Michele Quinn (among others) make a visit to Vamp and Tramp Booksellers to see some new examples of contemporary artist books. 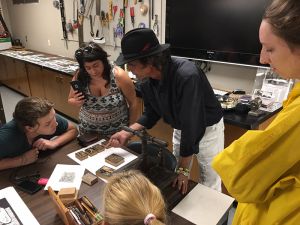 Cuban artist Ramón Vargas Artiz speaking with art students in the Book Arts type lab, September 2017.